Holy basil is a plant in the mint family known by several other names, including tulsi, Thai basil and monk's basil. The plant contains iron, calcium, vitamins A and C, and zinc. According to Drugs.com, holy basil historically has been used for upset stomachs, headaches and the common cold, but may also be an effective complementary treatment for high blood pressure. Always consult a health care professional before using holy basil. A study in the January 2012 issue of "Journal of Natural Remedies" examined the effects of a compound extracted from holy basil on metabolic syndrome, of which hypertension is a typical component. Participants who took 5 milliliters of the extract twice daily for three months dropped their systolic (top reading) blood pressure an average of 13 points, and diastolic (bottom reading) an average of eight points. (See Ref. 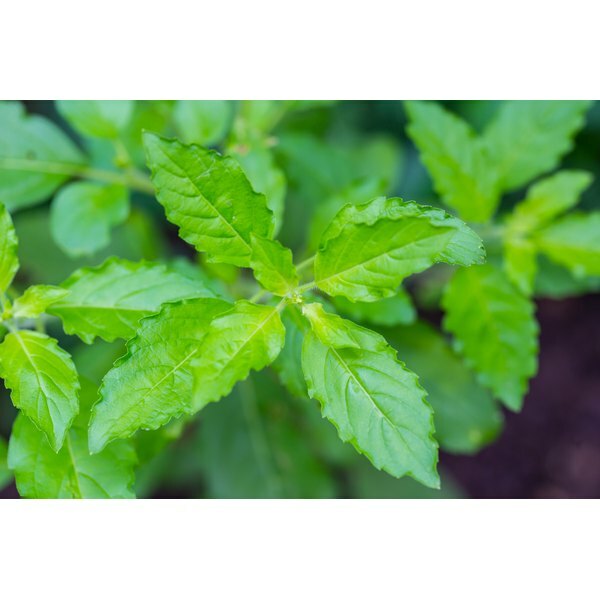 3) Another study in a 2009 issue of "Studies of Ethno-Medicine" concluded a combination of tulsi and neem leaf was beneficial to lower high blood pressure, along with ameliorating other symptoms of diabetes. An article on WebMedCentral.com concluded current data warrants further investigation of the beneficial health properties of holy basil and its active compounds.